Here's a photo taken behind the hide in Haigh Plantations of a robin making eye contact from a few feet away from me. They are beautiful little creatures, and so bold. Before the heating was turned on one would come into the house through the open front door and walk/hop around the dining room. I once held out bread in my fingers and one came down and pinched it just a couple of feet from my face. Fantastic photo, Harry. You must be proud. Good one. Very nice photo. We have a Robin bobbing about in the hedgerow in the garden next to our home. Harry,that's absolutely beautiful,it isn't very often that you would get eye contact with a little bird and more so a Robin...thank you for your trouble and patience. 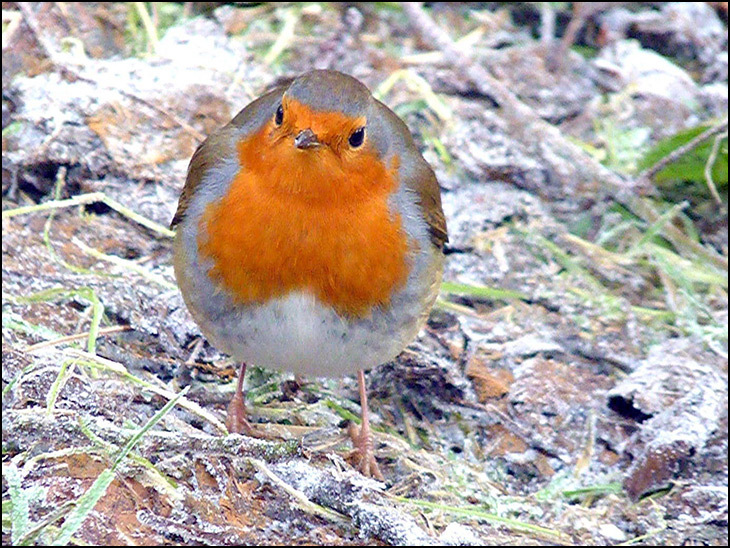 Hes not shy Harry ,it may be frosty but i bet hes lovely and warm under them fluffed up feathers, great shot. He's gorgeous! Doesn't look as if he's going short of a worm or two and it would make a very cheery Christmas card! How lovely! I love robins. Thankyou. this is fantastic Harry, brightened my day! A lovely shot of the Robin,which is the friendliest bird to us,but not to some other Robins,nice one Harry. Irene you love robins but could you eat a full one my finger is hovering over the submit button shall I be a devil.forgive me done. Thanks all, This was lucky shot I was watching it in the tree when it flew down and looked up at me, it seemed to be quite tame. H.
Oh, I couldn't eat that little man, Jim! In fact, I couldn't even eat a chocolate one as I'm not a sweet-tooth, so I'll just admire him. I have a silver one on my charm bracelet. x.
Christmas wouldn't be the same without a Robin. Those, like me , who dig in their gardens endlessly , will know how easy it is to attract a Robin, for me it never fails. Like Harry’s wonderful picture above shows , they are curious birds ,that have learned, like pigeons, seagulls and indeed squirrels and foxes, where a food source lies . Robins and such are so endearing that there can be a tendency to over feed , as I have , which can attract high numbers of small rodents, fine if you like them. As a child I saw sparrow in huge numbers . I remain haunted by the skylark I saw , as I am with kestrel and lapwing . Such is a gift, such is a moment.. I love to see a kestrel hovering, ready to pounce, Julie; a magical moment if you can catch it. It always reminds me of the film "Kes", based on the book, "A Kestrel for a Knave". Thanks, Harry for my essential Robin picture! It wouldn't be Christmas for me,without it...This little fellow brightened a dull snowy day! How lovely it is that larks and lapwings are once again a common sight.